The police arrest Dharma, a woman claiming to be Kate’s estranged mother, and charge her with murder. To prove Dharma’s innocence, Kate, her boyfriend Michael, and her German shepherd sidekick Bella dive deeply into the worlds of animal activism, organizational politics, and the dangerous obsessions that drive them. And if solving a murder weren't complicated enough, Kate will also have to decide whether or not to reconcile with the estranged mother who abandoned her over thirty years ago. Not to mention having to contend with an almost-bankrupt animal rescue, a cantankerous crow, an unwanted pigeon houseguest, and a rabbit in a doga class. What could possibly go wrong? 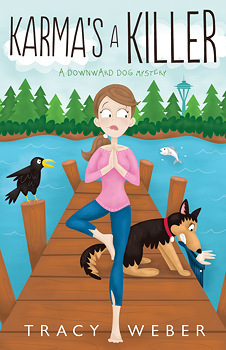 A taut tale with more twists and turns than a vinyasa yoga class, Karma’s a Killer brims with suspense, wit and whimsy. With a to-die-for plot, sensational storyline, and charming characters—of both the two- and four-legged varieties—Karma’s a Killer is a clever, colorful, and utterly captivating cozy mystery.